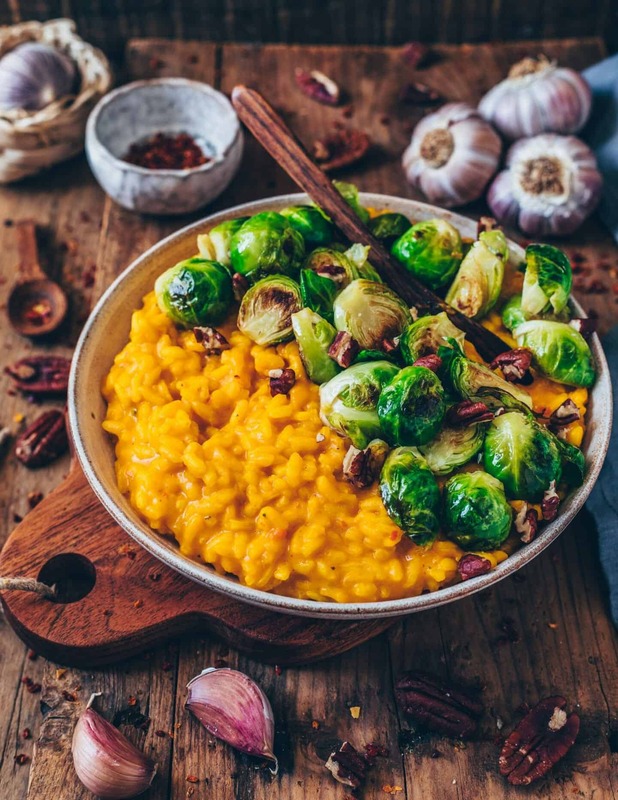 This Vegan Pumpkin Risotto with Brussels Sprouts is the perfect fall comfort food. It‘s healthy, gluten-free and incredibly delicious! The recipe is simple and ready in only 30 minutes. 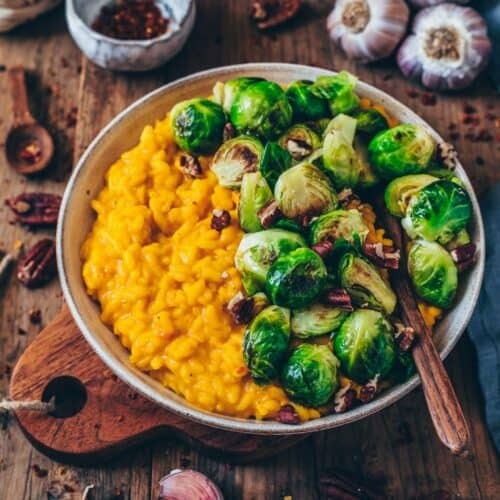 The best thing about fall is the pumpkin season, because I love pumpkin recipes! 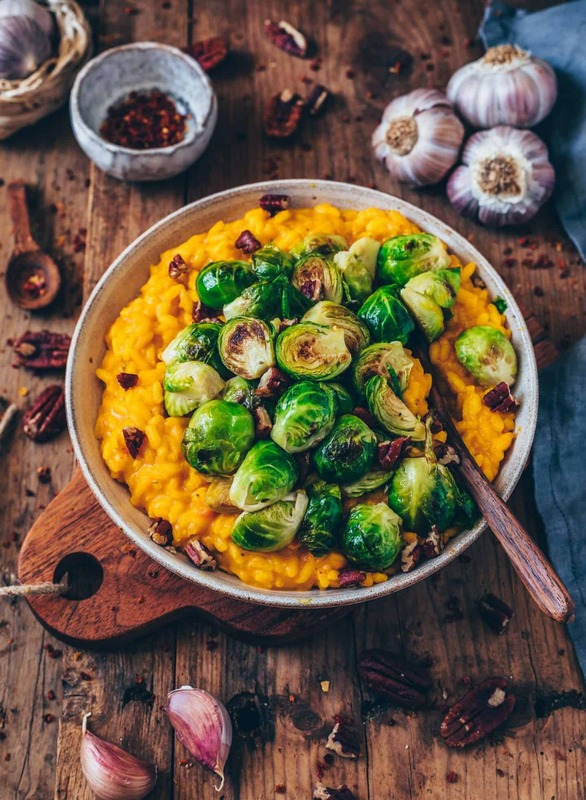 Pumpkin is not only super healthy, but also a versatile ingredient and adds a great flavor and creaminess to any meals. 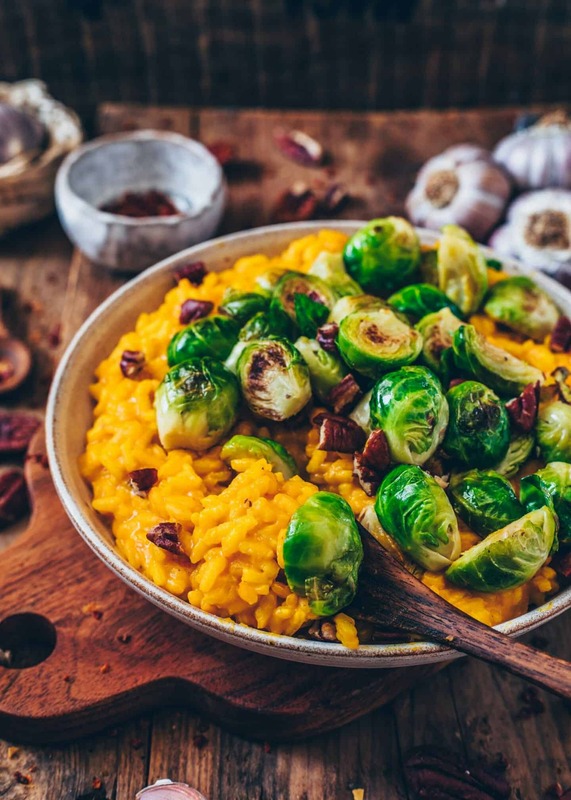 Anyways, this Vegan Pumpkin Risotto is one of those dishes that you definitely must try! Trust me, it tastes so good and it’s very easy and quick to make. I made a batch of pumpkin purée over the last days, because I use it so often for my recipes. I like roasted pumpkin best, so I prefer to bake it in the oven instead of cooking. Simply cut a pumpkin in half and scoop out the seeds with a spoon. Then brush a baking sheet or baking dish with a little oil and place the pumpkin with the interface down on it. Bake at 355°F (180°C) for about 25-50 minutes until the flesh is soft, depending on the size of the pumpkin. If using Hokkaido pumpkin, you don’t have to peel it because the skin softens while baking. But if using a pumpkin with a hard skin, such as butternut squash, you have to peel it before blending. 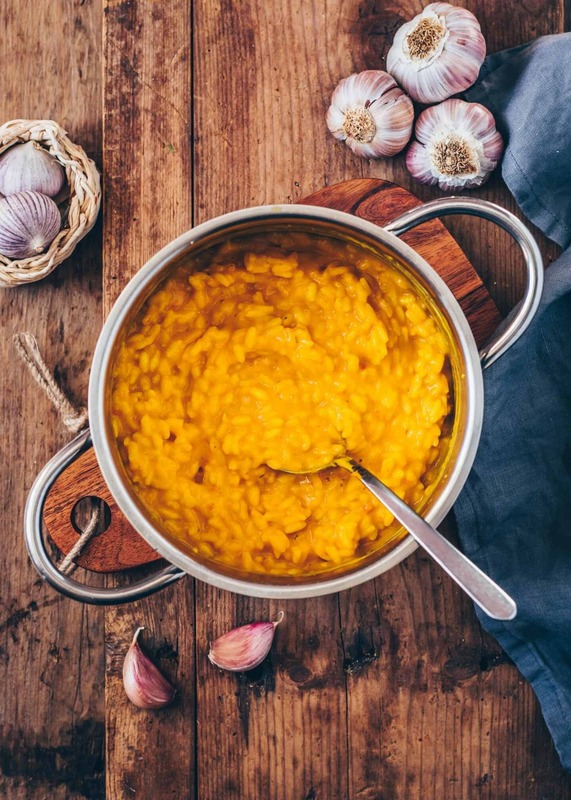 To make risotto, roast onions and garlic first, then add the rice. 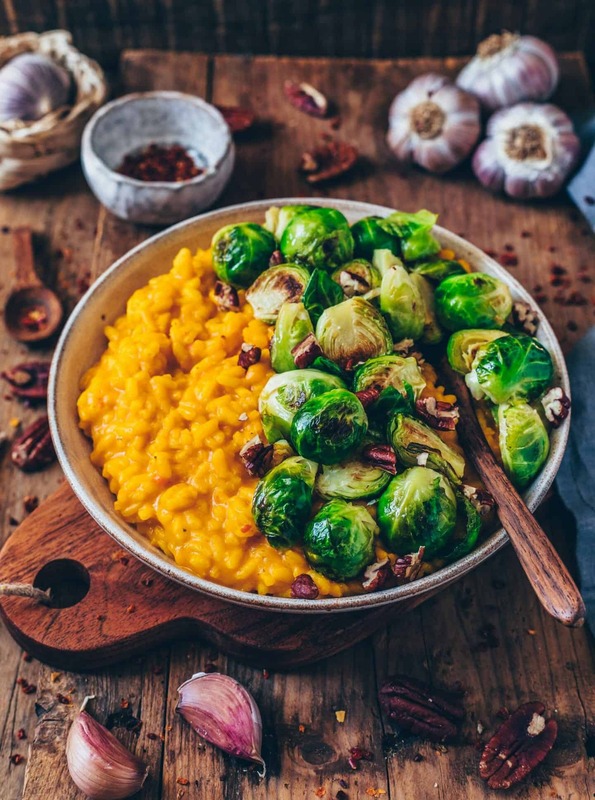 A minute later, deglaze with white wine and gradually pour in vegetable broth, pumpkin puree and coconut milk, while stirring frequently to prevent burning. As soon as the rice is al dente and the risotto is creamy (after about 15-20 minutes cooking time), it’s ready. 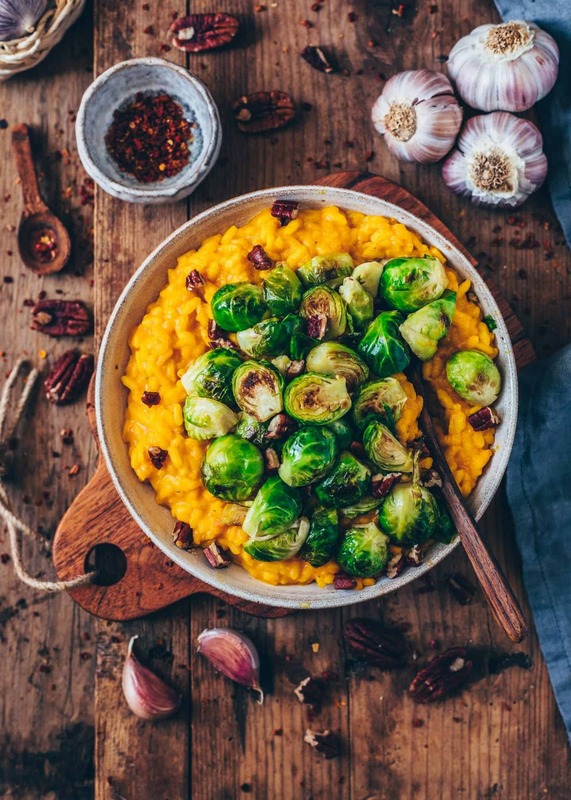 Brussels sprouts are one of my favorite fall vegetables, next to pumpkin and mushrooms. I like them most when they’re crispy roasted, because then they unfold their full flavors. 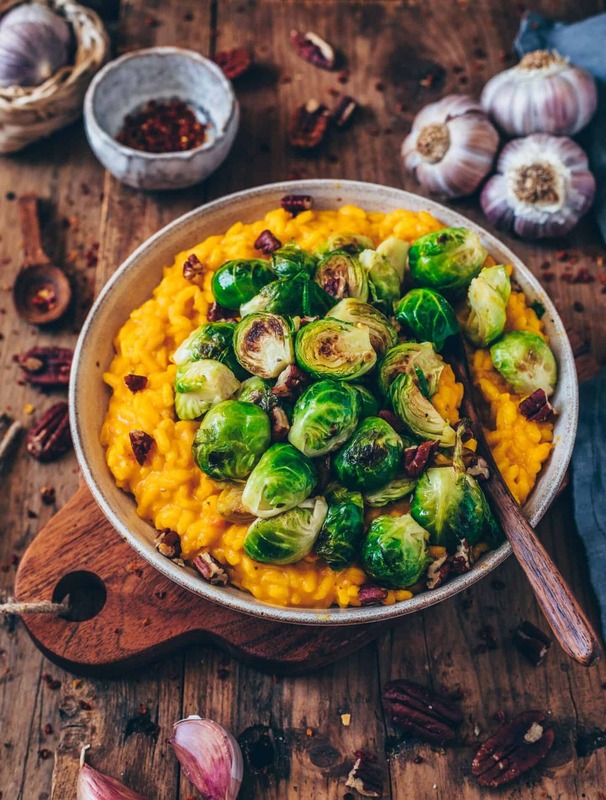 To make it even more flavorful and more autumnal, I love adding roasted pecan nuts as topping. They work perfectly with this dish! Of course, you can also use walnuts or pumpkin seeds or other nuts and seeds as topping, or omit them completely. Heat the olive oil in a skillet or saucepan. Sauté the onions until translucent for about 2-3 minutes. Add the garlic and the rice and cook for 1 minute longer, stirring frequently to prevent burning. Then deglaze with white wine and cook until the wine has evaporated. Reduce the heat to medium and begin adding broth into rice, a ladle at a time until rice absorbs each batch of liquid. Also, add pumpkin puree and coconut milk while cooking. 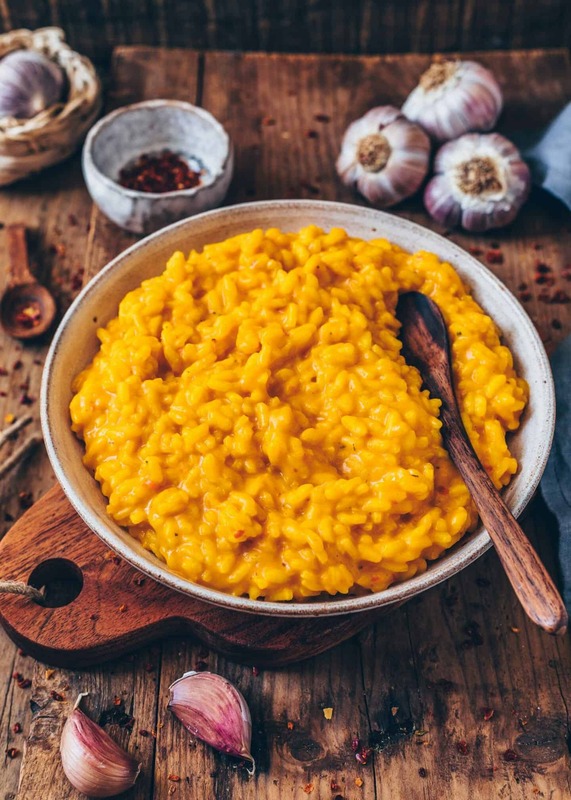 Cook for about 15-20 minutes until the rice is al dente and the risotto is creamy (don't forget to stir frequently to prevent burning). For more creaminess, stir in vegan parmesan cheese and season with salt and pepper to taste. Blanch the brussels sprouts in boiling water for 3-4 minutes or until just starting to soften. Drain and refresh in cold water to stop them cooking further. 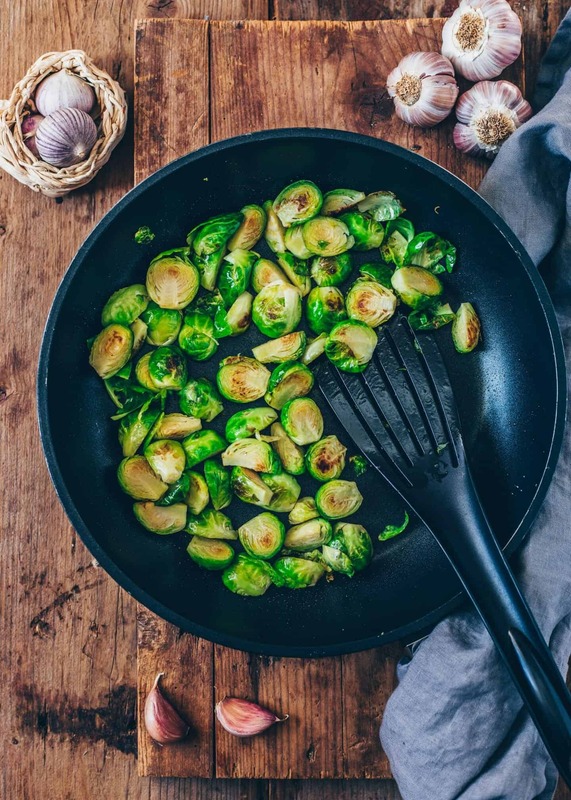 Heat the olive oil in a pan over medium-high heat and fry the Brussels sprouts for about 3-5 minutes until crisp and golden-brown from all sides. Season with salt and pepper to taste. Meanwhile, toast the pecan nuts in a small pan without adding oil. You can use canned/ tinned pumpkin purée or make your own according this recipe. Instead of coconut milk, you can use any plant-based cream or milk of choice. Or simply add more vegetable stock for a low-fat version. 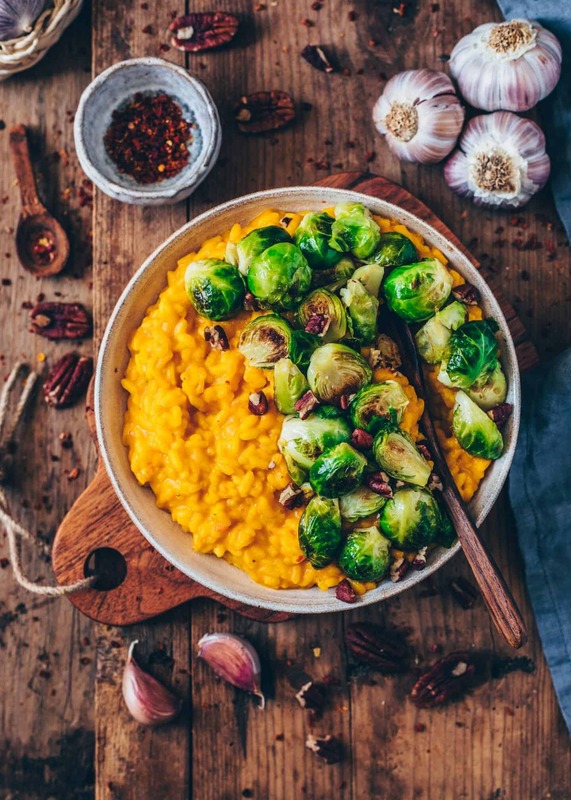 You can also roast the brussels sprouts in the oven as an option. Spread the florets on a baking sheet lined with parchment paper, brush with a little oil, toss to coat and bake at 355°F (180°C) for about 20-30 minutes until crisp and lightly browned, stir halfway through. Dear Bianca! I’d like to try this awesome dish. But unfortunately I am not that good in cooking things. So would you be so kind to convert “cups” to “grams”. Thank you in advance. Have fun trying the recipe! Thank you! Cooked it today and already post on my Instagram. So yummy and so aesthetic dish! I really enjoyed it! Thank you so much, Darya! I cooked this meal for my friend on monday. We loved it !!! It’s verry creamy and it taste Perfect with pecan nuts. Thanks again. Your blog is a gold mine. Thank you so much, Lauriane! This recipe is off the charts good! Five stars to the moon! I made it twice this week and then we had leftovers two days in a row. So…. 4 nights this was our dinner. That’s how good it is. I couldn’t find arborio rice so I used farro and i probably doubled the amount of farro and scaled back on veggie broth just because the farro doesn’t absorb as much. One night I used red onions and those also worked. The recipe is easy to make and really yummy. 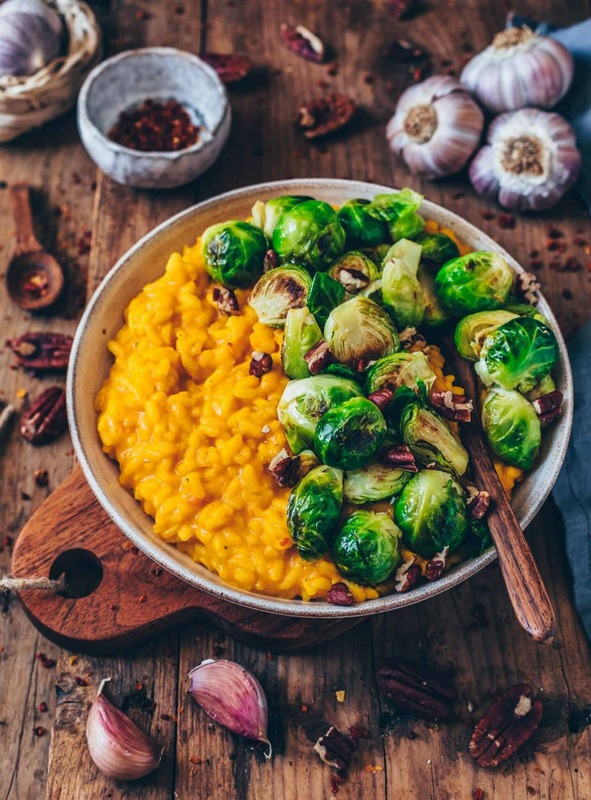 The mix of brussel sprouts, pecans and creamy risotto is perfect. I also love anything pumpkin.. Thank you so much, Kristie! I love that it’s so versatile. Will definitely try it with farro too! Sounds so good to me! 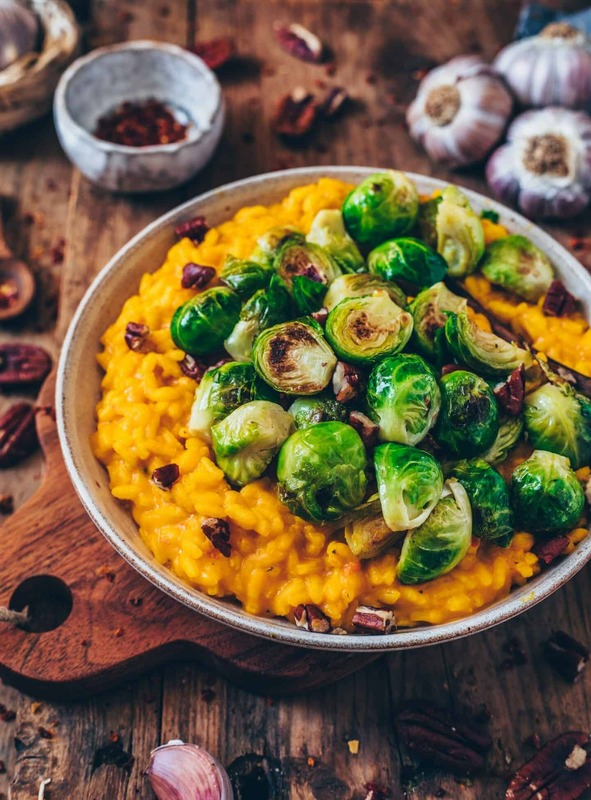 As a Belgium-girl, I really love Brussels sprouts so since I’ve become a vegan, I eat them a lot more. This was my first try out for the risotto (never made a risotto!) and waauw, this was way more easy than I thought. Even my boyfriend who has a problem with structures in his food, loved this one. Dear Bianca, you are a true source of inspiration for me as a newbie vegan! So glad that you and your boyfriend like the recipe.